I thought this guide for identifying eggcases on the British coast was wonderful. Will definitely printing off a copy for next summer. The name “beachcombers” was first given to a motley crew of European castaways and ship’s crew deserters making a living as best they could on South Pacific islands. Modern beachcombers can be quite serious about their activity, becoming experts on storms, ocean currents and seasonal events to increase their chance of an exciting find. Among the mounds of seaweed, tangled fishing nets and plastic bottles, booty can include shells, driftwood, semi-precious stones, and the content of lost shipping containers. A list has been drawn up of Britain’s top ten beachcombing beaches, taking into account tidal variation and gradient, as well as safety and accessibility. 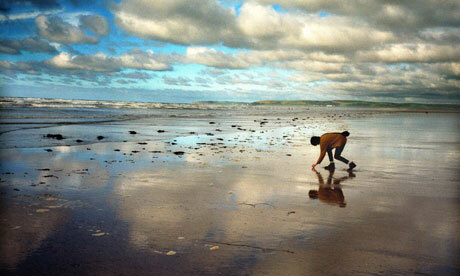 The photograph, which captures the absorption of beachcombing, is of Westward Ho! Devon, and it accompanies a Guardian article on activity holidays. best beaches for beachcombingbest beaches in BritainBritish beachesWestward Ho!